At times, electric vehicles have proved a conundrum to consumers looking to contribute to a greener environment. Although you can get them down to zero emissions, many people are wondering if an accelerated demand for EVs will trigger a greater consumption of fossil fuels. Approximately 41% of electricity worldwide is fueled by coal, with some of the biggest producers, like China, rising each year in consumption. With Tesla pushing over 400,000 pre-orders of their Model S worldwide, sustained infrastructure is becoming a greater concern. If EVs are triggering a larger consumption of fossil fuel, can they really be as environmentally friendly as they say? Absolutely. EVs are the pathway to increasing energy security if you are using the right tools. What many electric vehicle owners may not know, is that these vehicles can serve as battery storage for clean energy. This can be utilized well beyond the means of the car. Now, your vehicle can power the garage door for itself. There are quite a few ways to produce fuel besides coal. The sun and the wind also provide ample amounts of energy. The two most effective methods for producing electricity besides coal, are through solar panels and wind turbines. The Virginia Center for Wind Energy (VCWE) and Virginia Clean Cities (VCC) created a predictive model to examine the costs and emissions of different transportation options in regard to fossil and renewable fuels. After 1 year, the cost of purchasing and charging an EV on solar power is $27,298.75 compared to regular electricity, which would be $27,184.34, and wind at $29,398.75. After 5 years, the purchase and cost of charging an EV on solar power $29,398.75 while the purchase of a gas car and refueling would be $40,287.51. Furthermore, wind and solar are the only two sources with zero emissions across the board. Even regular electricity emits .77 tons of carbon after just one year—and gas is at a whopping 4.51 tons, with a price tag of $31,963.69 per year. Therefore, it is important that EV owners are aware of the clean methods in which they can charge the cars. San Diego firm Envision Solar has developed the world’s first, 100% solar-charged EV station named EV ARC (Electric Vehicle Autonomous Renewable Charger). It is fully autonomous, completely mobile, and provides total renewable electricity for EVs in public areas. Because it is off the grid, the EV ARC does not require any foundation, electrical upgrades, or building permits. The convenient charger is designed to fit within the dimensions of a single parking space (9’x18’) and produces between 3,800 to 7,000 kWh of solar electricity annually—that’s 16 kWh per day! The system also comes with 21.6 kWh of energy storage, which even allows EV owners to charge their vehicles at night. The spectacular unit can deliver up to 100 electric miles per day, promising not an ounce of carbon emissions. GE’s Sanya Skypump looks like an over-sized pinwheel you may have played with as a kid, but it captures the energy that drives you for miles. The brainchild of Urban Green Energy (UGE), a manufacturer of distributed wind and hybrid renewable energy solutions, the Skypump uses a UGE-4K wind turbine in conjunction with meticulously placed solar panels, to produce electricity that is publicly powering EVs. The first Skypump was installed just outside Cespa’s global headquarters near Barcelona about 6 years ago and since, the company has had requests from industries around the world looking to install the model for their EV customers. Measuring in at 42 feet tall, the Skypump requires a minimum wind speed of seven miles per hour to fully operate. The energy that is generated by the wind is then sent to a Level 2 GE Durastation located at the base. All required electrical systems are located within the tower, allowing for easy maintenance, with exceptional ventilation. 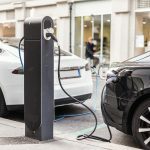 EV owners concerned with clean energy should be pleased to know that within the past 6 months, a hybrid charger for the two renewable sources has been developed. Created by Sweden-based energy company Innoventum, it’s called The Giraffe 2.0 and it’s an electric car charging station powered by both solar and wind. The wooden structure is comprised of 24 solar modules, as well as a 12-meter-tall wind turbine. It can be used with a standalone station with two, Level 2 connectors or 50 kW DC fast-chargers, or built into a home or business as an additional means of energy. The system can produce up to 13.8 MWh per year (10 000 – 20 000 kWh per year) depending on the wind speed and insolation level. The faster you charge your EV, the cleaner it will be. You can even take it a step further by sharing the energy with your home or office in a method known as vehicle-to-grid charging (V2G). The ambitious startup Electrefy is currently working on an EV smart charger so fast, it can reboot a battery up to 80% in just 20 minutes. Currently, most chargers take at least an hour depending on the level. The best part? They are designing them to recharge themselves during off-peak hours. Many companies are recommending that if you install a solar station for your EV, you might as well use it for the building too. Tesla estimated that it would only take an additional 10 panels on the home to accommodate one of their Model S vehicles. Which equates to approximately $2,000. The world’s first fully integrated Solar PV, EV charging hub, and storage facility was recently opened in Sheffield, UK and is saving people over 40% on current energy prices. The 3-bay carpark boasts a PV installation of 7kWp and a 50kW Rapid EV charger. For energy storage, there’s a 20 kWh Li-Ion battery with a 25-year lifetime guarantee. This means battery degradation will never impact vehicle performance at Sheffield. It’s a smart station, that’s fully equipped, and this is exactly how EV owners will be saving money in the future. The easiest option for an EV owner to use clean energy is to simply follow the time. Set your car to charge when the electricity grid is at its greenest. The carbon intensity of the grid fluctuates, and there are times when more sources are coming from renewable fuels, than fossil. National Grid and the Environmental Defense Fund Europe have composed a chart for Great Britain that maps the “dirtiest” and “cleanest” times for the grid— up to two days in advance. For UK EV owners seeking to go greener, monitoring these timeframes is an excellent and convenient way to make a difference. (Not to mention you can also turn your appliances off at these times too). As companies look at more ways to take charging stations off-grid, innovative new solutions are using renewable sources. Reducing grid dependency by using solar energy is a process being adopted by city fleets too. Alternative energy is quickly becoming a solution for everyone. Tesla eventually plans to disconnect all of their super-chargers and go solar with battery packs. Smart chargers that are ramping up in minutes instead of hours are key ways in which EV owners are saving the planet. Lastly, simply paying attention to the grid can give you important clues as to when to plug in and how to optimize the cleanest energy you can.